"A boy character has been a top request from our fans for decades"
Logan, second from left, is American Girl's first boy character. American Girl is getting its first boy character this season, Today.com reports. Logan Everett, a gray-eyed, brown-haired boy who plays the drums, is an 18-inch doll being released Thursday with Tenney, a female singer-songwriter. 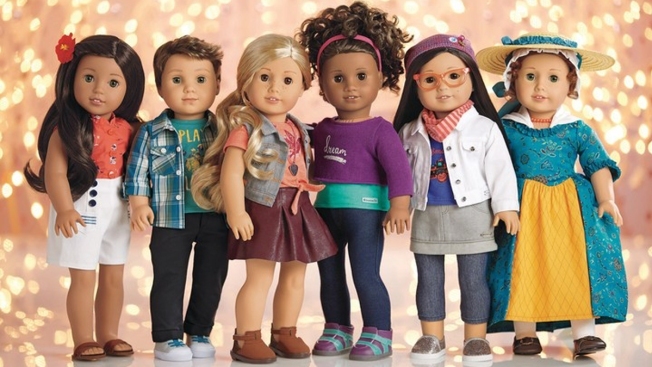 They are part of American Girl's plans to launch dolls with diverse backgrounds, experiences and personalities in 2017, according to a press release. "A boy character has been a top request from our fans for decades," Julie Parks, a representative for American Girl, told Today.com. Some moms have already been changing their 18-inch girl dolls into boys for their sons.